Global stocks rebounded in the first quarter, but the ride was rocky. Even in a rising market, volatility is a clear and present danger. With so many risks clouding the outlook, we believe that investors should focus on generating a smoother pattern of returns. In fact, volatility has persisted this year, even as stocks recovered. 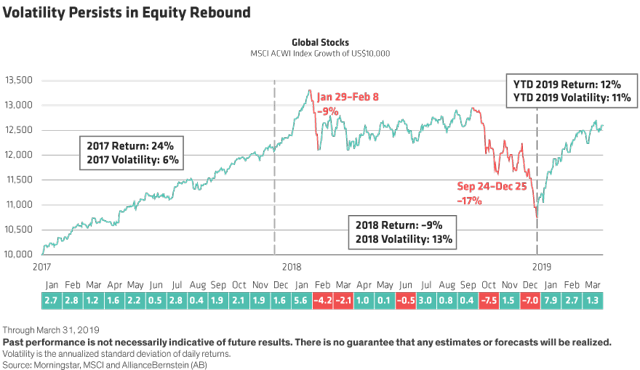 The daily volatility of the MSCI ACWI Index was 11%, slightly lower than the 13% recorded during last year's down market. The index rose or fell by at least 1% in eight days during the quarter. At that rate, we can expect 24 more days of sharp gains or declines through the year-end. We're clearly in a much more turbulent environment than we were in 2017, when only three days of gains or losses of more than 1% were recorded. Some indicators tell a different story. The VIX Index, which measures US market volatility, is low. But the VIX captures forward-looking expectations of future short-term realized volatility. It doesn't reflect the actual volatility that investors have experienced in sharp swings of trading patterns. Big drawdowns can be unsettling for investors. But selling out of equities when the market corrects is often a mistake. Indeed, investors who exited stocks during the late 2018 downturn would have forfeited returns from the rebound in early 2019. Since it's almost impossible to time inflection points in the market, we believe staying invested through bouts of volatility is essential for success. Brexit, trade wars, China's economy and global growth are just some of the risks that may continue to fuel volatility this year. In this environment, we think it's important to consider investment strategies that can help investors capture good sources of long-term return potential but that are also designed to provide resilience to downturns and deliver a more comfortable investment journey.